In the UK, A Short Album About Love was released as a digipack. 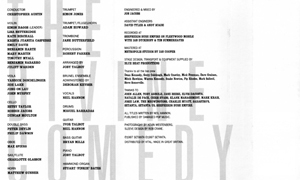 On one side the digipack features the front cover on the right, the back tracklisting on the middle, and a photo of Neil Hannon in a NYC taxi on the left. The other side features the CD tray on the right, the album credit on the left, and a montage of live photos from the Shepherd’s Bush Empire concert on the middle. On the CD tray we can read ‘DIGIPAK® Manuf. By J. Upton, England 021 692 1171, as licenced by AGI USA’. Some releases came with a CD-like advert to subscribe to Setanta’s mailing list. It features the covers of the four albums over the Casanova artwork. Indeed following the success of Casanova, Liberation and Promenade were reissued by Setanta Records. At the time the album was released, a box set was also available. The box is plain black and features on the front the ‘Divine Comedy’ logo, the album title and on the top-right corner ‘Setanta 036’. On the side the band name, the album title again and the catalogue number (‘SETCDL036’). And on the back there are a small Setanta logo and a white frame ‘Limited edition number’ featuring a sticker with the edition number. Some of them also feature a bar code sticker with the serial number. The first issues of this box set features A Short Album and 3 cards associated with each Everybody Knows singles to come. 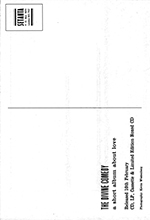 Each has on one side the front cover of the single without the title and in black and white. 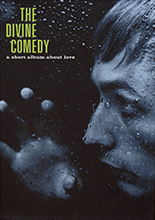 The first card features on back merchandising infos, the second celebrate the fabulous night of the Shepherd’s Bush Empire night, and the third adverts the 3 other Divine Comedy albums. The digipack album in the box set is the same as the standard digipack. The Short Album LP is very simple: the front cover has the same photo with the same title (although the very right of the photo is not printed, the cover being square). It also features on the bottom-right corner ‘SETANTA 036’. 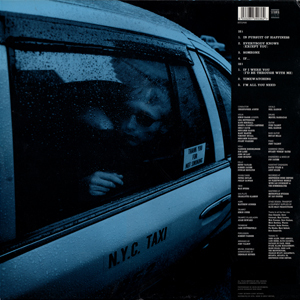 The back cover features the taxi photo and a black frame on the right with the usual infos: bar code, logos, tracklisting, credits and copyright notes (dated 1997). The disc itself is not very special too. As usual the A side features the band and album names, and the B side the tracklistings for both sides. Both labels are also copyrighted from 1996.
and : (logo) SET LP 036B1 .... THAN NEVER TO HAVE LOVED AT ALL on the B side..
Like Casanova, the Short Album cassette has a front with small difference from the CD version. Of course the photo is the same but fits in only a square box. The upper part is a black box featuring the band logo and the album title on the right instead of the bottom. The top right corner features the reference ‘SETANTA 036’. The side is very similar to the digipack side except the catalogue number which is not the same (‘SETMC036’) and is printed in the other direction. The back part features the tracklisting for both sides and additional info like bar code, Setanta logo, catalogue number and copyright notes. The other side of the inlay features the album credits with a different design from the CD version. They are printed in black on a white background with a grey ‘The Divine Comedy’ logo. The logo is also different from the usual ASAAL logo as the 3 words have the same left alignment. The tape itself features on top the band and album names with their usual fonts. On left it features a Setanta logo and on right the catalogue number and copyright dates (both 1997). Strangely nothing tells us which side is which, but it is actually the A-side which features the tracklistings of the two sides. Setanta released two promo CDs. Both are different. 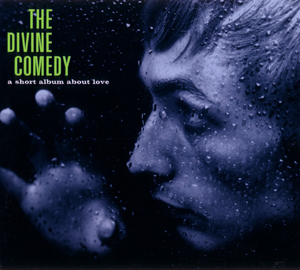 This one is black, but the design for ‘THE DIVINE COMEDY’ - as well as the colour (usually green) - isn’t those of the typical A Short Album About Love release. Everything written on it is printed transparent, on a black background. At the top we have a Setanta logo and the band name. At the bottom we have the album title, the catalogue number, a promo mention and the copyrights (1996). The tracklisting is printed at the edge. Some of them were distributed with a sticker on the back featuring the tracklisting and a release note: “Hot on the heels of their three Top 30 singles, Something For The Weekend, Becoming More Like Alfie and The Frog Princess, and the highly-acclaimed Casanova album, The Divine Comedy release A Short Album About Love on Feb 10, just in time for Valentine’s Day. This promo CD was used for the promotion of the album in late 1996 and in 1997. The CD is in a Setanta card sleeve with the logo and a promo mention. The CD looks the same as the basic British edition with the mention ℗ 1996 and © 1996. 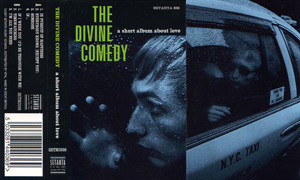 This promotional tape was produced by The Divine Comedy’s new publisher BMG Music Publishing (until Casanova the songs were published by Damaged Pop Music). It was probably issued in late 1996 because it seems at that moment the album title was still unknown. Indeed the tape is entitled ‘New Album Mixes’. Another interesting fact is the tracklist order which is different from the usual order: ‘Timewatching’ being just after ‘Someone’ and not ‘If I Were You’. This unusual order being actually the order in which the songs were played the night of the Shepherd’s Bush Empire concert, which lead to think that was meant to be the original album order. The sleeve is a simple BMG Music Publishing sleeve which features the BMG logo and their address. On the side a paper is stick featuring the band and album titles. On the inlay a paper featuring the titles and the tracklisting is stick. The tape is a simple recordable tape on which stickers featuring BMG’s logo and contact info have been stick on both side. The A-side features the six first songs, and only the last song is on the B-side. As the title says, the versions of the songs are the usual album versions, and not pre-mixes. The Short Album postcard features the front cover artwork on one side and release details, photo credit and the Setanta address on the other one. However different sizes of this postcard exist, all featuring exactly the same details.